Two weeks. That's all we've got left. Two weeks from today, the NHL trade deadline arrives. 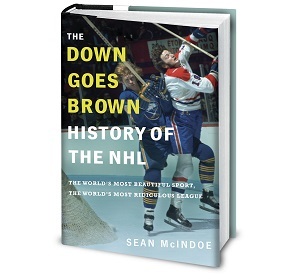 For fans, the day and everything that builds up to it serve as one of the highlights of the hockey calendar, a perfect medley of intrigue and speculation that culminates in a day-long finale. We call in sick, camp out in front of the TV, and watch the deals roll in. It's fun. But for general managers around the league, the trade deadline isn't about entertainment. It's about reality. It's about cutting the crap, taking a good hard look at a season that's roughly three-quarters done, and figuring out what exactly this particular iteration of your roster is going to be when it grows up. In short: Are you in or out? Or, in some cases: Are you out, but close enough that you can pretend that you're in? Around the league, 23 teams wake up today either holding down a playoff spot or sitting within a half-dozen points of one. Only four teams are trailing by double digits. Heck, last year's Senators roared back from a 14-point deficit in mid-February to make the playoffs; only the Maple Leafs are outside that range today. Everyone else is still in this thing. That's all a big lie, of course. Almost all of those bubble teams on the outside looking in today won't make it, and many won't even come close. In most cases, they won't deserve to—these are teams that lose far more often than they win and give up far more goals than they score. They're bad teams having bad seasons, and they should be throwing in the towel and looking toward the future. But most won't. We're still in it, they'll insist. We can pull this off. A lot of that is wishful thinking. Some of it is cynical marketing. A good chunk is just simple self-preservation—if you're a GM in a league where parity reigns and you get points for losing, admitting that the team you've built is dead in the water before you've even hit the 60-game mark is a great way to put a target on your own back. Sure, it may be better in the long run to move a veteran for a pick or prospect that will help three years down the line, but that's easier said than done if you expect to be unemployed by then. Factor in the potential for impatient fans, a demanding local media, and an owner who may have set your budget based on at least a few games of postseason revenue, and the stakes are high. So if you're a GM with two weeks left to figure out where you stand, what do you do? One bubble team has already made its decision. The Ottawa Senators pushed their chips in last week, acquiring Dion Phaneuf from the Maple Leafs in a surprise blockbuster that made them better in the short term even as it saddled them with a potentially disastrous long-term contract. Even eight points out with five teams to pass, the Senators have decided that they're in. Other teams will have to make their own calls soon. The Flyers, for example, are six points back; they were in a similar situation last year, when rookie GM Ron Hextall made the rare call to stand pat and keep focused on the future. Does he do the same this time? The Flames and Canucks were first-round opponents last year, but there won't be room for both in the Western Conference this time. The Flames are eight points back and fading, while the Canucks are five out after somehow getting outplayed by the Leafs' ECHL squad on Saturday. Both teams should probably look toward the future. Meanwhile, the Canadiens are already reeling from a two-month cold streak and now face reports that Carey Price is done for the season. They're denying that, but these days it feels like Habs fans have already thrown in the towel and moved on to the Auston Matthews watch; it will be fascinating to see if GM Marc Bergevin does the same. We could keep going down the list, one that includes teams like the Predators, Avalanche, Islanders and Penguins. And then there's perhaps the toughest bubble case of all: the free-falling Minnesota Wild. They've already pulled the trigger on one major move, firing head coach Mike Yeo on Saturday after losing eight straight and 13 out of 14. The Wild are five points out and look every bit like a team that desperately needs to start over, but with so many massive contracts clogging the books they may not be able to. When you're clearly in win-now mode but can't find a way to win now, you're almost forced to double down, no matter how unlikely it is to work. Each of those teams have tough calls to make, and just two weeks left to make them. And for the GMs involved, their ability to cut out the self-delusion and get real might go a long way to determining whether they're even still on the job this time next year. The five teams with the best shot at winning the Stanley Cup. 5. St. Louis Blues (32-17-9, +6 true goals differential)—They have a realistic shot of finishing in fourth place overall in the league and starting the playoffs on the road. The Central, man. 4. Los Angeles (33-19-3, +22)—They've alternated losses and wins over their last nine games, and now Marian Gaborik is on the injured reserve and could be out long term after a knee-on-knee collision in Friday's win over the Rangers.